I love a good BB cream. The beauty balm hype has been going strong since Garnier introduced the first version to eager UK shoppers in 2011 and a whole array of major brands have been releasing their own version ever since. BB cream was invented in the 1960’s to protect women’s post surgery skin, so was originally a heavy mix of protective skin care including SPF and makeup to cover up problem areas whilst they healed. After it took off in Asia in the 1980s, it was introduced to the us with the promise that we were about to discover the secret of pore perfect Korean actresses. Unfortunately, many brands popped BB on their tinted moisturisers and getting your little mitts on a real life BB cream was far more difficult than it seemed. 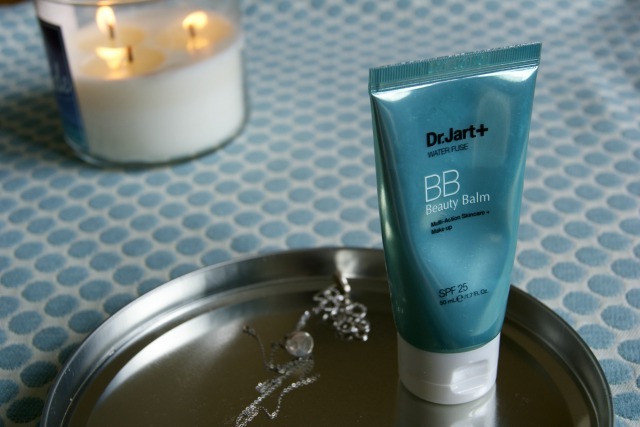 So, when Korean brand, Dr Jart, launched their BB cream in the UK it all got a bit exciting. When it’s warm, wearing a full foundation can feel heavy and a bit grimy (best word for it) so a BB cream gives a lighter feel with the added benefit of built in SPF. I’m usually in a hurry to get ready so moisturiser, SPF and coverage, all in one is like a little dream for me. Finding a BB cream for oily skin isn’t easy though, given the number of BB creams on the market that are just tinted moisturisers and make my oily skin shinier than a really shiny thing on shine day. After reading a lot of BB cream reviews, I had high hopes for the original Dr Jarts BB cream range. Dr Jarts+ BB cream comes in four formulations and if there’s one thing my crazy skinned teenage days taught me, it’s that my oily skin gets maaaddddd if I don’t moisturise it so I chose Water Fuse for it’s hydrating, but oil free, formula. I was initially dubious that it only comes in one (slightly grey) shade, but it matches perfectly well with my skin tone. As BB creams go, it also has a thick consistency, but the 50% water ratio of the formula means that it blends into the skin like a dream, (particularly useful when you’re in a hurry). I was impressed with the medium coverage it gives too. It doesn’t give me the perfect coverage that some reviews suggest it will but top it up with a little concealer and it gives a lovely dewy finish without the grease us oily skinned girls dread. I’m wearing this every day at the moment and by the end of the day it’s still holding tight on my skin. To enhance my love of this little ray of sunshine, it also contains Aloe Leaf juice to reduce moisture loss throughout the day, Portulaca Oleracea Extract to minimise redness and SPF 25, you know, to stop me turning into a wrinkle monster. Winner!